The most common choices for the shape of a bowl are sections of a circle or an ellipse. 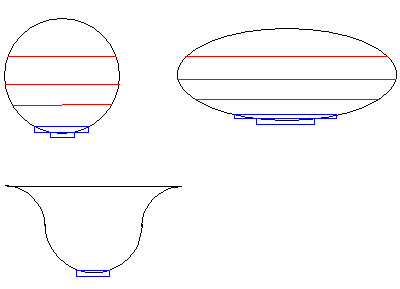 Other options include complex curves, such as the ogee curve. The diagram below shows a few alternatives. The red lines show possible choices for the top of the bowl and the blue lines show possibilities for the foot. These are by no means the only shapes that can be used. The permutations are potentially endless. There are several considerations to take into account when deciding the size, position and shape for the foot. The foot can significantly affect the visual appearance of the bowl. Too large a foot will make the bowl look heavy and to tall or too short a foot can also impact how the bowl looks. Apart from the visual appearance, the intended function should also be considered. A functional bowl will need a foot big enough to ensure stability but a purely decorative bowl might benefit visually from a smaller foot. The foot can also be just a flat at the bottom of the curve rather than a protruding foot. When turning the inside of the bowl, some means of holding it on the lathe is obviously needed. Most people use a chuck these days (they make life much easier) but faceplates or sacrificial glue blocks can also be used if a chuck isn’t available. I’m assuming a chuck will be used and that gives us two choices – either a dovetail recess or a spigot. Unless you are extremely careful (and perhaps fortunate!) the chuck jaws will mark the wood so I work on the basis that the base will need to be turned again once the inside of the bowl is finished. For this reason, it is useful to leave some wood on the base to centre the bowl and if the friction drive method is used, this can also provide somewhere to apply pressure with the live centre or ring centre (more later on this). 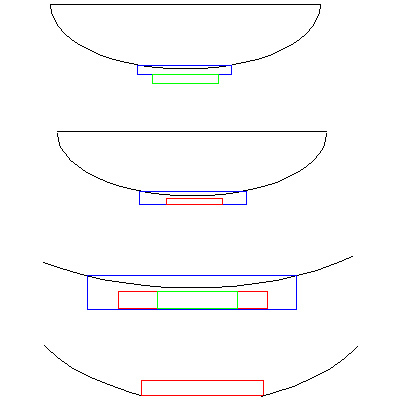 The green lines show areas that will be removed to complete the bowl. These parts are used for holding the bowl. The blue lines show the intended foot for the bowl and the red lines show an internal recess for use with dovetail jaws. Note that the edge of the recess should be angled to match your chuck jaws.